Google will surely announce the next version to Android 4.2 Jelly Bean at Google I/O 2013. Historically, it was seen that Google I/O proved to be a perfect platform to announce either new hardware or standalone software releases. Such was the case last year when Google announced Android 4.2 Jelly Bean along with Nexus 7 at Google I/O 2012. Now the whole world is waiting to see Android 5.0 (Key Lime Pie) to be announced officially at Google I/O 2013. Until now, it was believed that Google is almost ready to announce Key Lime Pie along with Motorola X, the Nexus 5, and lastly an improvised version of Nexus 7. With the Motorola X still in a prototype stage, it is said that Google has shelved plans to release Android 5.0 at Google I/0 2013.Instead, Google could announce Android 4.3 Jelly Bean at the upcoming developers' conference, slated to be held next month. A new report has surfaced (via The Android Police). The folks are claiming that Google is working on Android 4.3 Jelly Bean, and it is possible to see full action unfolds next month at Google I/O 2013. Yes, you heard it right. Google still wants to name the next version of Android as Jelly Bean. The information should not be taken as a serious affair. The folks over at The Android Police traced IP address that belongs to Google. Two IP addresses, belongs to Google employees. 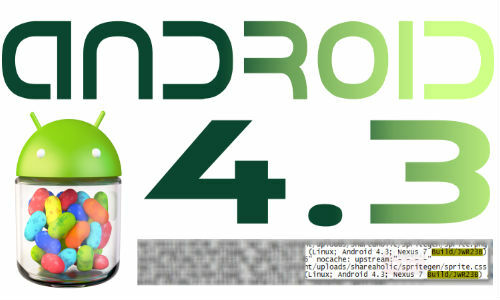 And the build number...Android 4.3 JWR23B, certainly hints at the next iteration to Android 4.2 Jelly Bean. It is said that the Nexus 4 and Nexus 7, are the first set of devices to get updated to Android 4.3 Jelly Bean. It was reported few days back that Google might delay Android 5.0 by 2- 4 months. Many of the tech vendors still use Android 4.1 Jelly Bean to power up their latest flagship models. The download rate of Android 4.2 .2 Jelly Bean is still low at the moment. So, it makes sense to delay the coming of Android 5.0, which is expected to offer few features. Currently, Sony already got Android 5.0 PDK, as per one report. Google could announce the Nexus 4 with 4G LTE functionality, as the next-gen service has gained a large number of followers in the western world. The next-version of Nexus 7 is also slated to appear with Full HD display, and Qualcomm Snapdragon processor. Stay tuned to GizBot.